.:. Hiking in Big Sur .:. Due to the rainy season and past slides, many of the Big Sur area parks are closed or limited, including the full McWay Falls lookout, Pfeiffer State Park and Ewoldsen trails. <!- -------------------------> l pais grande del sur, or the big country to the south is how Big Sur was first described by Spanish settlers from the Monterey area. It is one of those rare places that is wild and remote, yet easy to access and explore. While there are miles of trails for the dedicated hiker and backpacker, Big Sur also offers spectacular scenery within steps of Highway 1. And for those willing to hike a few miles, the rewards include rapidly changing settings of oak and lush redwood forests, ocean views, rocky streams, and coastal brush. This web site is a collection of favorite day hikes, both easy and challenging, sorted by scenic appeal and personal bias. 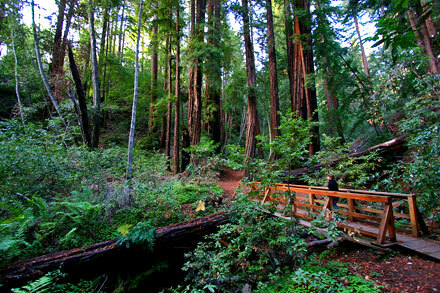 Having hiked in Big Sur for over 30 years, it's a neverending treat to bring visitors in for a day or two. The question quickly arises: "which hikes are a must-see while we're here?" Not an easy one to answer, since everyone has different preferences. But there are a few spots the first time visitor needs to see, and a handful of hikes the persistent visitor won't want to miss. If you only have one day to see the sights, take a look at the Must See page, where you'll find the best place to stop for hiking as you drive up or down the coast. Hiking in Big Sur is reliably safe, but there are a few Hazards to be aware of. In particular, know how to identify poison oak, and what to do if you inadvertently touch it. 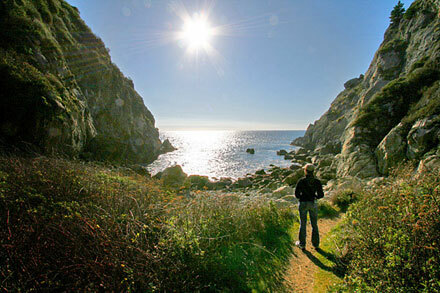 This website features a Hike Map of the Big Sur coast, with the locations of all hikes described here and major landmarks noted. Each hike also has its own printable trail map. There is also a page with Big Sur Information, including links to local weather forecasts, information about the best times to visit the area, and other points of interest. 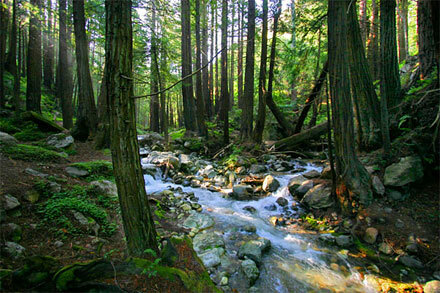 Other Adventures includes several more favorite excursions near the Big Sur area. These include visiting the Elephant Seals just north of San Simeon, Point Lobos south of Carmel, and Montana De Oro State Park near Morro Bay. Finally, the Big Sur Photo Gallery offers some favorite pictures taken on various hikes in Big Sur, and presented in no particular order.